Nutri Ninja vs Nutribullet which of these bullet style blenders is the right one for your kitchen ? The easiest, most flavorful way to get in your five daily servings of fruits and veggies is by drinking them in delicious smoothies. But, what’s the best at-home blender to make those amazing smoothies? In the countertop blender world, the NutriBullet first made a name for itself as a blender similarly made to the Magic Bullet, created and marketed extensively via infomercials by Homeland Housewares. It’s extremely popular, with thousands of reviews and satisfied users. It also opened up a whole new market for single-use, fast, and easy countertop blenders, so the Nutri Ninja appeared. It’s made by the SharkNinja company, who also manufacture vacuum cleaners. If you are in a hurry and don't have the time to spend reading the rest of this article the comparison between Nutri Ninja vs Nutribullet our top pick is the Nutri Ninja. 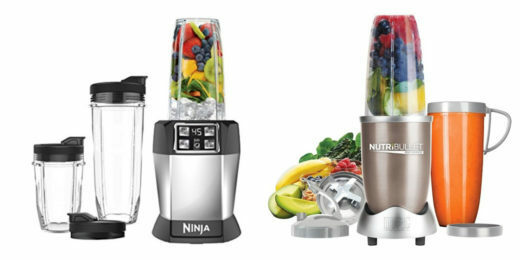 The Nutri Ninja has a slight edge on power a better blending performance and is better value. In this article, we’ll go through every single feature that you look for in a countertop blender, then compare the two. Which one is better? How do they compare when deciding which features are the best? What is the difference between the Nutri Ninja and Nutribullet? Which one makes a better smoothie? Read on to find out more! The Nutri Ninja Auto-IQ blender is powered by a 1000 Watt motor that can handle ice, seeds, root vegetables, frozen fruit and just about any other smoothie ingredients you can think of. The Auto-IQ feature gives you two different pre-programmed settings for different types of blending: Auto-IQ Blend and Auto-IQ Ultra Blend. ​Auto-IQ Blend - for use on softer ingredients that don't require too much power to get the job done. The Ultral-Blend settings has a number of pauses throughout the blending cycle that lasts about a minute. Each pause allows for the heavier material that is not yet broken up to sink down to the blades ready to be pulsed when the pause if finished. ​This press and go feature is a real joy as you don't need to stand over the Ninja and manually stop it to ensure everything is getting blended equally like you do with the Nutribullet. There is also a start stop button should you wish to do the blending in a more manual manner. The Nutribullet Pro is powered by a 900 Watt motor which can handle practically any fruit and almost all vegetables with ease. It is quite a compact design so it will take up only a small space on your countertop, or can be stored easily away out of sight when not in use. The Pro is one hell of a blender and has firmly replaced the original 600 Watt Nutribullet as their most popular model. You ​get two colossal 32 ounce cups with a number of extra lids. Those larger sized cups make preparing a large smoothie or protein drink ahead of time a real time saver. The Nutribullet is a breeze to use, pop in your favorite ingredients(bulky items first) add some water or other liquid, screw on the blade bottom, flip it over and insert into the base, twist and away it goes. When shopping for your next small countertop blender, the design is probably the first feature to catch your eye. You want a blender that is small and compact, while still being powerful. It should also be as quiet as possible, since many of us prefer a breakfast smoothie without waking up the entire household. In this respect, the Nutri Ninja and the NutriBullet differ quite widely. Let’s take a look at each one’s design, to see which is the clear winner in this blender battle. As soon as you unbox the Nutri Ninja, you’ll notice that it’s much larger than the NutriBullet. Its base is thicker at the top, with angled sides. There are rubber feet underneath that attach it securely to your countertop. To lift it off the counter, simply tilt it backwards and the suction should come off. The tall plastic cup is also angled on the sides, similar to the NutriBullet cup. This company offers up to three different cup sizes of 24 oz, 18 oz, or 12 oz. Each come with a Sip & Seal lid and have a “Max” line on the plastic, to let you know how much to fill it. Except for the Auto-iQ model, which has programmable buttons, with the Nutri Ninja, you press down on the top of the cup to get it to pulse and it does not have any additional speeds. The Nutri Ninja is much noisier than the NutriBullet, thanks to its more powerful 900 or 1000 watt motors. That does have the positive quality of improving the blending capability. It’s also much larger and bulkier, taking up more counter space. Some users have commented that it doesn’t have the same durability as a NutriBullet and feels like it’s made with less-expensive materials. The NutriBullet first caught the public’s eye with its sleek, almost space-age design, and it continues to provide a handsome appearance on your kitchen counter. You can see how the smaller model 600 stacks up against the Magic Bullet here. It’s more attractively designed than the Nutri Ninja, with an overall conical shape that saves space. It has a circular, brushed metal base that contains the 900 watt power motor. The blending cups come in two different sizes of either small (18 oz) or large (24 oz), with handles and lids. You can also purchase a separate 32 ounce size. The cups have a ‘Max’ fill line on them, and you are advised to pay close attention to not filling with foods or liquids over that, or leakage will occur. Also, the blade housing must be screwed on securely before placing in the base as well. While the motor on this NutriBullet is smaller than the Nutri Ninja, it does have an added bonus of also being quieter. While it still does make a loud blending noise, it’s not as much of a racket as the Ninja. Overall, this product is made well, is solidly built, and it has a cool, eye-catching design that not only makes it nice to look at but contributes to the NutriBullet’s overall function. Winner: NutriBullet definitely wins this category of design. When the primary function for these little blenders is to blend, then we have to do a complete comparison of the two! Blending depends on the types of foods being processed, the blender’s motor, the actual blending time, and the blade position. The Nutri Ninja blending power and superior smoother texture come from its more powerful motors. The Nutri Ninja Auto-iQ has a 1000 watt motor, while the Nutri Ninja Pro has a 900 watt motor. That’s probably the reason why the base is much larger than the NutriBullet base, too. The more powerful the motor, the better it is able to crush difficult things like ice or seeds. The Ninja also blends your smoothies and foods into a much smoother texture than the NutriBullet. You won’t find much ‘grindness’ or ‘coarseness’ or pulp after blending. As with its competitor, you want to carefully pack the Nutri Ninja blending cup in order to get the most of its blending power. Add liquids only up to the ‘max’ line. Start by pulsing, and then blend to desired consistency. Just because the Nutri Ninja wins doesn’t mean that the NutriBullet Pro doesn’t have devoted buyers who prefer its blended texture. However, we did have to dock points, since the motor isn’t as powerful, at only 900 watts. It does deliver a good texture, although you might find more grittiness, coarseness, or pulp when compared to the Nutri Ninja. As with that other blender, it’s important to follow instructions about the most correct way to load the blending cup, starting with heavier fruits and vegetables on the bottom. The reason it doesn’t blend as well as the Ninja is because of the blade design, which was discussed above. It doesn’t reach up into the contents to get the smoothest texture. Most NutriBullet models don’t blend ice, so you’ll have to add liquid or yogurt only. Only add it up until the ‘Max’ line on the cup. Despite its weaker motor, many customers prefer the NutriBullet’s blending power and use it frequently. Winner: While it isn’t as easy to operate in terms of quick blending like the NutriBullet, the Nutri Ninja wins this category for overall blending power and texture; it beats the bullet, shall we say? As a general rule of thumb, both of these blenders, the Nutri Ninja and the NutriBullet, are easy to use. 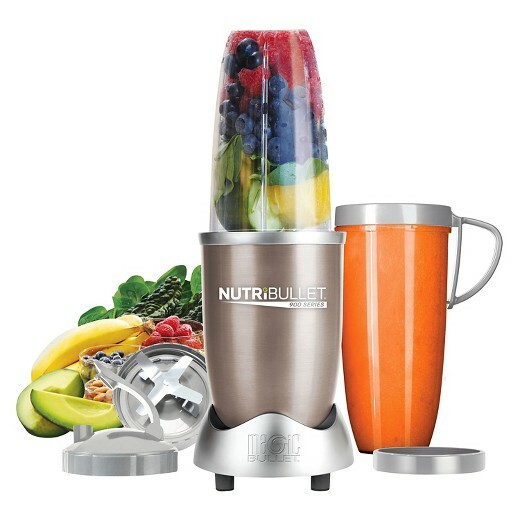 You fill the cups with fruits and vegetables, add water up to the max line, add the blade housing top, flip them over, and pulse until you reach the desired blending consistency. You can purchase upgraded models with fancier features, but even those are easy to understand. If you’ve only had a NutriBullet before and are switching over to the Nutri Ninja, then you’ll find it works in roughly the same way and is just as easy to use. The ‘max’ line is at a different height than the same line on the NutriBullet’s cup, which is something to watch out for. That’s the maximum fill line for liquids. The Nutri Ninja also comes with a recipe booklet for creating simple recipes. You can make smoothies, salad dressing, soups, and snack dips, too. The Nutri Ninja Auto-iQ Blender has four buttons on the front to start/stop, blend, pulse, or ultra blend, as well as a countdown timer for each option. Overall, it’s a very simple machine to operate and, although there’s an instruction manual included, doesn’t take more than a couple of minutes to set up and start blending. The NutriBullet really set the standard for small smoothie blenders, and one of the biggest reasons is that it’s so easy to use. There are no buttons to push, or levers to press, or controls to fiddle with. One good tip about filling the cup is to add heavier foods first, so they can press down on lighter foods like spinach or kale. After filling the cup, you screw on the blade housing, then flip it upside down and set on the NutriBullet base. The small indentations line up on the base, and then you simply press down to pulse and blend the foods together. Some of the newer models are hands free, which is a nice feature and makes it even easier. You blend until you get your desired smoothness, then take it off the base, unscrew the blade housing, and it’s ready to drink. Winner: It’s a tie in this category. A blender like the NutriBullet or the Nutri Ninja is designed for daily use, so maintaining it in top form for months at a time is essential. This includes cleaning of all the parts, adding or using accessories, and being careful to use it properly. Read on to see which one ends up scoring big in this category. The Nutri Ninja has a totally different blade design than the NutriBullet, so that means it’s not encased in its housing. It protrudes from the rest of its circular housing, and you’ll notice that all the parts are made out of metal. That means it’s especially durable and long lasting. Also, the metal blades can be easily reached for cleaning. You can clean the tops of the blades, underneath the blades, and all the way around the interior of the blade housing. It’s designed for easy access to all its parts. The plastic cups are fairly easy to keep clean, just like any other plastic dish. They are dishwasher safe and it’s recommended to wash them in hot soapy water as well. Keep them clean, and they’ll last for months. The cup tops screw on and stay there. The plastic is durable and meant to last. Besides those maintenance tips, you’re also advised to wipe down the base of the Nutri Ninja after use, which will keep it in good working order. The NutriBullet, due to its more straightforward and sleeker design, is actually more difficult to clean than the Nutri Ninja. That’s because of the blade design. The blades are held inside the circular housing. This allows you to put more fruits and veggies inside the cup, but it also makes the blades extremely difficult to clean. Also, not all of the blade parts are metal. They’re held in place with plastic parts, which have been known to collect water or bits of food and even grow moldy over time. It’s very hard to clean underneath the blades, which increases the risk for mold and rust as well. Due to this blade design flaw, you can expect to have your NutriBullet for a shorter period of time than the Nutri Ninja before it becomes too hard to maintain and keep clean. The NutriBullet cups are just as easy to clean as the Nutri Ninja, with a nice wide mouth that’s large enough to fit your hand. They’re durable and dishwasher safe as well. Winner: Due to its blade design and the sturdiness and easy cleanliness of the mechanism, the Nutri Ninja wins this category. Nutribullet vs Nutri Ninja: winner ? Now that we’ve come to the end of our blender battle, it’s easy to see why the NutriBullet’s popularity kicked off a range of imitators, the Nutri Ninja being the most success. Which one is better for you Nutri Ninja vs Nutribullet ? Let’s look at the winners of each category. The Nutri Ninja is the clear winner here, with a score of three vs two for the NutriBullet. The Nutri Ninja wins because of its superior motor power, its blending mechanism that creates a smoother texture, and it has a better blade design. However, be on the lookout for Nutribullet to keep releasing new models. They’re still extremely popular!